is a temporary add-on that lasts 90 days and has to be reapplied. For a permanent solution, you can subscribe to the Verizon Smart Family™. can also be managed via the My Verizon app. From the My Verizon Home screen, navigate: Plan > Bloqueos. 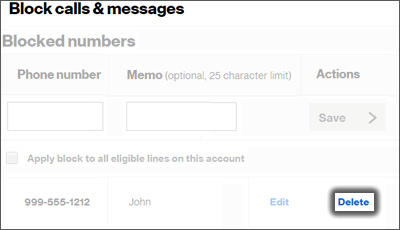 From the Block Calls & Messages section, click Delete next to the number to be removed.